Note: This tool is in Beta. IHE (Integrating the Healthcare Enterprise) does a great job of defining solutions that use best practices to address important use cases. Integration profiles define which actors must perform which transactions. Actor names are intentionally generic—such as Image Display or Image Manager/Archive, instead of common product names like PACS or RIS—so that the capability described can be claimed by a multitude of products (for example, a VNA). The challenge for buyers is understanding which specific integration profiles and actor combinations are important for commercial products. Because of this confusion, buyers often ask vendors about support for integration profiles and actors within their products, that may not be necessary to achieve the buyer’s clinical and technical goals. 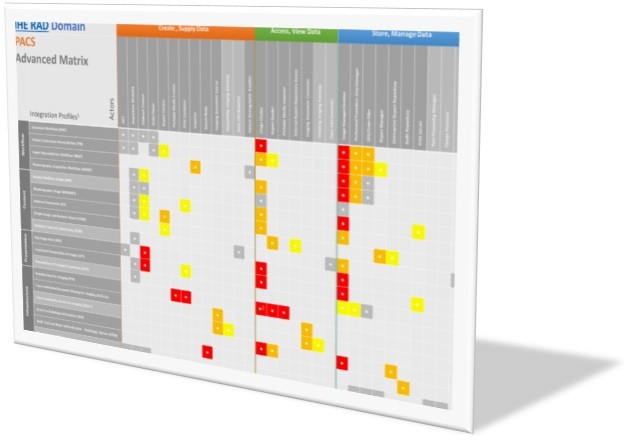 The IHE Buyers’ Guide tool allows the user to select one or more commercial products—PACS, VNA, RIS, and/or Enterprise Viewer—and it will produce a “heat map”, showing the most important integration profiles and actors from the IHE Radiology (RAD) and/or the IHE IT Infrastructure (ITI) domains. Integration profile and actor combinations are rated as Very Important (red), Somewhat Important (orange), Not Important (yellow) or Not Applicable (grey). The tool is designed for use by buyers when procuring a system. It includes integration profiles that are stable and final (status of Final Text), and where there is some evidence that commercial products that support the integration profile are available on the market, or will be available very soon. If there is no commercial system available that supports an integration profile, including it as a requirement in an RFP is of low value. 2017: Digital Breast Tomosynthesis (DBT) integration profile was added to the tool for Enterprise Viewer, PACS, and VNA products. 2016: Imaging Object Change Management (IOCM) integration profile was added as it is now in Final Text and there are products available on the market that support this profile. 2016: The priority of the Image Manager/Archive actor for PACS and VNA for Radiation Exposure Monitoring (REM) was raised from Somewhat Important to Very Important to reflect buyers’ priorities. The following IHE integration profiles are not in a status of Final Text, so have not been added to the IHE Buyers’ Guide yet. The expected importance of each profile/actor combination for each product type is provided, as a preview. Integration Profiles are organized under their IHE Domain. This revision to SWF is in Trial Implementation. It is revised to require Actors to support HL7 v2.5 within relevant transactions. The importance for each actor within each product type specified in the IHE Buyers Guide remains the same, however. SWF.b incorporates the changes specified by CP-222. It adds several valuable attributes to existing transactions to make data values fully qualified and easier to transfer across enterprises. These attributes include Issuer of Accession Number and Institution Name and Institution Code Sequence. It also makes Issuer of Patient ID available in many transactions, such as Query Modality Worklist. Currently in development. Expected to be in Trial Implementation during 2018. This integration profile is a replacement of MHD-I. It is based on DICOMweb QIDO-RS and WADO-RS and provides a mechanism to interface with XDS-I backends as well as MHD. Currently in Trial Implementation. The Web-based Image Capture (WIC) profile provides a simple, lightweight, mobile-friendly mechanism to encode and send captured images, videos and evidence documents from a mobile device to an Image Manager so that these objects can be easily integrated into the rest of the imaging record. Currently in development. Expected to be in Trial Implementation during 2018. Standardizes how to retrieve external priors and reports and coerce them to local context during import. Intended to establish a standardized report retrieve interface. Currently in development. Expected to be in Trial Implementation during 2018. Standardizes how encounter-based workflow can reliably capture metadata with images, like the traditional Scheduled Workflow (SWF) integration profile does for Radiology. Currently, the integration profile focuses on modality-based devices used in an encounter setting (e.g. Point of Care US). Mobile capture apps are not the primary focus, but some of the metadata capture aspects are equally applicable. The Invoke Image Display profile allows the user of an Image Display Invoker, typically a non-image-aware system like an EHR, PHR or RIS, to request the display of studies for a patient, and have the display performed by an image-aware system like an Image Display (Enterprise Viewer). The Digital Breast Tomosynthesis (DBT) integration profile specifies the creation, exchange, and use of DBT images. It defines basic display capabilities that Image Displays are expected to provide, especially simultaneous review of 3D DBT and conventional 2D mammography images (FFDM). Definition of the handling of annotations and key images are included. As this profile has reached Final Text status, it was added to the IHE Buyers’ Guide in 2017. Note: The DBT Extension, currently in Trial Implementation status, supports the option of storing the “For Presentation” Breast Projection X-Ray Images and “For Processing” Breast Projection X-Ray Images. These images are different from the traditional Digital Mammography images (MG), using the enhanced multi-frame functional groups. Currently in Trial Implementation. Manages CT protocols, which is a challenge among CT scanners today. Several modality vendors are supportive of this profile. Note: Anyone interested in this integration profile should monitor IHE Connectathon participation to see if anyone participates with a system representing as the Protocol Manager/Archive actor. This workflow profile concerns the use of imaging report templates to create diagnostic imaging reports. This profile distinguishes between report authoring templates, which are templates used by Radiologists to guide the creation of a clinical imaging report, and report instance templates, which describe technical constraints on the structure and content of imaging report instances, such as the constraints described in and XML schema or the HL7® Clinical Document Architecture. This profile applies to the former, report authoring templates, and describes methods for the formatting of imaging report templates and the management of their transport between template libraries and report creation systems. Specifically, this profile describes an enhanced feature set for report authoring templates, delineates how such templates from a vendor-agnostic template library could be used immediately by a reporting system, and provides a format for migration of templates between reporting systems. Note: The priority for Report Template Manager and Report Template Creator are not rated as a higher priority as these are likely to be provided by an online service, such as RadReport.org, rather than an on-premise system. This profile is intended to propagate the Clinical Decision Support and Appropriate Use Criteria (AUC) information throughout the existing Radiology Scheduled Workflow transactions. It is designed to work with the CDS Profile in IHE Patient Care Coordination (PCC) – Guideline Appropriate Ordering (GAO), which focuses on obtaining the CDS information and the interaction between the Order Placer and the CDS system. Note: There have been multiple delays in the date by which the use of CDS is required by PAMA, which may delay demand in solutions. Currently in Trial Implementation. Addresses tracking, reporting, and management of radiopharmaceutical administered dose information in a manner similar to that already adopted for ionizing radiation via the REM Profile. Note: Several integration profiles, such as those that contain the word Mobile in their title, depend on HL7® Fast Healthcare Interoperability Resources (FHIR). They will not reach Final Text until the FHIR standard become normative. The Mobile access to Health Documents (MHD) profile defines one standardized interface to health documents (a.k.a. an Application Programming Interface (API)) for use by mobile devices so that deployment of mobile applications is more consistent and reusable within a single policy domain. MHD can be used to allow mobile devices, or other resource-constrained systems, access to an XDS Repository, but MHD transactions are not specifically tied to XDS; some of the system implementations envisioned may interface directly to an organizational EHR, or a multi-national PHR. The PIXm profile exposes the functionality of a Patient Identifier Cross-reference Manager to mobile applications and lightweight browser applications. Note: If any of the above systems are expected to interface with a PIX Manager that supports PIXm, the priority would obviously be Very Important. The PDQm profile exposes the functionality of a patient demographics supplier to mobile applications and lightweight browser applications. Note: If any of the above systems are expected to interface with a Patient Demographics Supplier that supports PDQm, the priority would obviously be Very Important. This supplement updates the XDS and XDR profiles to add support for the updating and deleting of metadata. Note: Any system that is a Document Source actor in XDS should also be a Document Administrator actor. If a VNA is an XDS Document Registry actor, then its priority would be Very Important. Crisis Response: Covers the distribution of notifications to health workers. Care Reminders: Covers the distribution of notifications to care givers and subjects of care based on upcoming or missed appointments as defined, medication reminders and other similar patient care reminders. Note: It is expected that these capabilities are more likely sought in an EHR system, but depending on the intent, the priority may be higher for some buyers. Important for any system using a RESTful API. Likely to become more popular as systems adopt DICOMweb™ and HL7® FHIR web-based APIs.